Cutler has spent over four decades refining and perfecting the pavement recycling process. With the environmental, energy, and economic issues of today, Cutler's innovations and commitment to the hot-in-place, single pass repaving process has made it a key component for road maintenance programs. By using less energy and emitting fewer greenhouse gases than other repaving methods, hot-in-place recycling can help meet sustainability requirements. 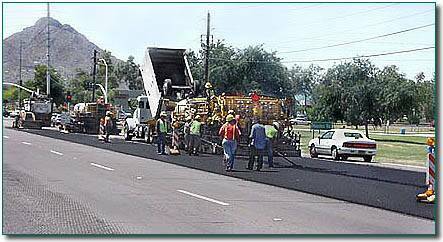 Because it is a single-pass repaving method, it saves both time and taxpayer dollars. While a Preheater is used in advance of the Repaver, Cutler's single pass process insures that a thermal, monolithic bond is achieved because the Repaver both recycles and lays the final wearing surface simultaneously. This unique process minimizes traffic delays and offers improved conditions for motorist safety. The specified hot mix asphalt is delivered to the Repaver and deposited in the front receiving hopper where it is conveyed the length of the Repaver by means of a drag slat conveyor to paving screed, where it is laid and compacted. To view each step of Cutler's pavement recycling process, please click on the numerals in the above illustration. For technical information about the process or equipment specifications contact the agent serving your area.